Product Test by Vince Bottomley, creator of Precision Rifle WebZine. About two years ago, I bought a borescope. It's something I had always wanted, but didn't really need--or so I thought! The hefty price-tag had always stopped me taking the plunge but then the value of the dollar started to slump and with the exchange rate hovering around 1.9, I jumped-in with both feet and bought the basic kit. With postage, import-duty and VAT it cost me well over £300 but I've never regretted the purchase and like so many things, you soon begin to wonder how you managed without it! Ken Harrington, marketing manager with Gradient Lens Corporation, makers of the Hawkeye Precision Borescope, was over in Germany at the IWA Show to push his product in Europe. Borescopes are popular with serious shooters in America but not so on this side of the Atlantic and I think that Ken was quite surprised to meet someone who already had one. He also spotted my Press tag. Ken asked, "Would you like to do a write-up on our borescopes?" I replied, "You bet!". Ken told me, "In that case we had better send you (on loan) our top of the range model with focusing eye-piece." Here it is, in all its custom-cased glory. NOTE: The deluxe version comes with a custom-fitted metal hard-case. My basic model came in a cardboard box. The Hawkeye Precision Borescope duly arrived and in addition, Ken was able to supply some of the photographs that accompany this article, as my digital dabblings don't quite run to photographing the inside of a barrel! But, let's get on with it and see what all the fuss is about. The Gradient Lens Corporation has designed, engineered and manufactured precision optics and optical instruments for over twenty years. They are located in Rochester, New York, also the home of Bausch & Lomb, another highly respected lens and optical instrument maker. Although the simple rigid borescope is best suited to our application, many other models are available, including a super-slim model, and a flexible scope. Of course there are adaptors which enable not only the digital photographs accompanying this article to be produced but also allow the use of a video camera in conjunction with a TV monitor. Here is a BoreScope Video by Dan Lilja showing a Lilja custom hand-lapped barrel vs. a factory barrel. You will be amazed at what the borescope reveals. BoreScope Video by Dan Lilja Showing Custom vs. Factory Barrel. My own personal borescope is the most basic kit and comes in a cardboard box. It does not have adjustable focus (no problem for bores between .223 and .300) and the eyepiece is straight (rather than the more expensive angled version). I am well pleased with my purchase. However, I'll concede a right-angle eyepiece would be very handy for a gunsmith who uses the borescope regularly. So, how will a borescope benefit the precision shooter? The best use is undoubtedly inspecting the condition of your rifle's bore. You can tell immediately if your cleaning regime is effective, or inspect for throat-erosion and the general condition of the rifling. In addition, I have found that it is very useful for inspecting newly-cut chambers – making sure they are free from scoring and other machining defects and you can even have a good look at the muzzle-crown from the inside--one of the most important parts of any barrel. 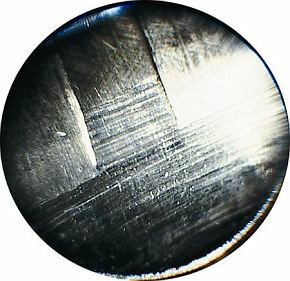 Tiny burrs can often be present on newly-cut crowns and even the most minute damage to a crown (often caused by careless cleaning) can play havoc with accuracy. For the professional gunsmith, you could say that a borescope is the equivalent of a doctor's stethoscope. In addition, you can look into all-sorts of small orifices, such as cartridge-cases. Head separation, for example, can be dangerous as well as ruining your shoot. If you experience head-separation from one case, does it mean that others are on the verge of splitting? Do you chuck 'em all away or take a chance? The borescope will quickly reveal the first signs of stress within the case. You can look inside your dies to see if they are marking the cases, or even peer inside your bolt--an often overlooked area which can be responsible for delayed lock-time and light-strikes. Of course, the borescope wasn't invented just for the convenience of shooters. They are used throughout industry and I'm sure you've already imagined other ways a borescope will come in handy other than inspecting the inside of barrels. 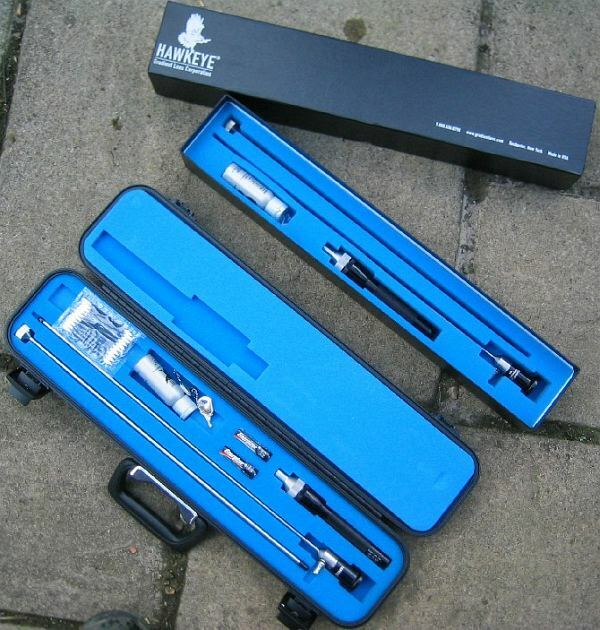 The basic borescope kit will do for most of us, although the ability to focus and the ease of use of the right-angle eye-piece are 'nice to have' additions. Fortunately, the lens-system has excellent depth of field and a magnification of around 10-power and I can't think of any application that the average shooter will encounter which could not be inspected by the basic model. The outer stainless-steel tube is 0.188 inches in diameter so .17 barrels are out but .223 is no problem. I perhaps use my borescope a couple of times a month on average but a busy gunsmith might use one on a daily basis. That is where the angled-eyepiece would really pay dividends. Similarly, a means of focusing will also be occasionally handy so it's worth forking out the extra if the 'scope is in regular use. My cardboard-box is fine for careful home use but the proper metal case is better for protecting a delicate instrument which may be subject to accidental damage. Shooting colleagues occasionally ask to borrow the borescope and they are sometimes horrified by what they see and on occasion it has prompted a rapid 'get-shut of it' policy! A borescope would be a great money-generator for any gunsmith! If you are going to buy a second-hand rifle and can't test it on-range, a quick look with the borescope will tell you if there are any horrors lurking in there. A quick borescoping could be a good way to get a price reduction! If shooting classic military rifles is your bag, then again the borescope can save you from buying a piece of junk. What looks like a bright, shiney bore when you hold it up to the light and peer down the barrel, is often completely worn-out. Of course, most of us aren't used to looking inside rifle bores. When starting out, you need to learn what a bore in good condition looks like. I did this by looking down a selection of new match barrels--both cut- and button-rifled and also by looking at a few new factory bores on test rifles. You soon begin to get a feel for it. 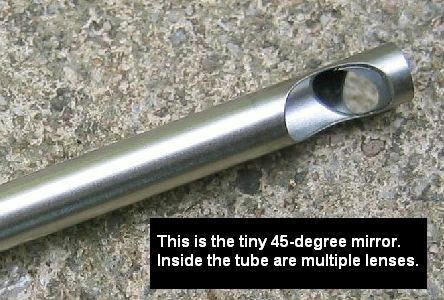 The mirror is angled at 45° so you get a very clear picture of the rifling. The mirror is designed to rotate so you can inspect the rifling radially as you advance up the bore. The probe is 17 inches long, so if you go in from both ends you can cover a 28 inch barrel with an action fitted. Having said that, most of the problems tend to occur at the chamber-end in the first six-inches of the barrel. 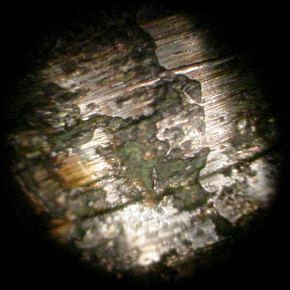 Most readers will be aware of the fouling that can build up on a bore from burnt powder and the bullet's copper jacket. Powder-fouling is not too difficult to remove but copper can be another matter. If copper is left in the bore it will tend to attract more copper until the build-up is sufficient to start distorting subsequent bullets. Copper-fouling is often most prevalent when breaking-in a new barrel. So, when breaking in my 'project' rifle, I scoped the bore after every cleaning. Copper build-up was moderate and I managed to get most of it out quite easily using Sweets but there was one stubborn streak about three-inches down from the muzzle. It took me a good hour to get rid of it with JB paste but at least I knew where to work the bore. Without the use of a borescope, it would still be there. The photo on the left shows the lands just forward of the chamber--this is a brand-new barrel and the reamer-marks can be clearly seen across the lands. 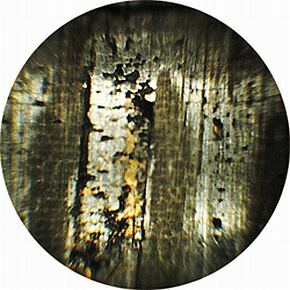 When you run-in a new barrel, you are smoothing-out these marks--which will initially strip copper from the bullet. 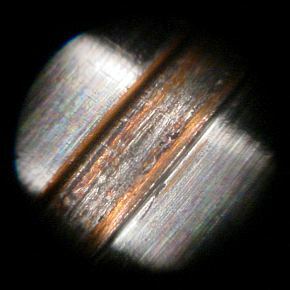 The right-hand shot shows a typical fire-cracked and copper-impregnated bore just forward of the chamber. This can happen very quickly--in as little as 1000 rounds. Copper will be stripped from the bullets and accuracy will suffer. A few years ago, before I had a borescope, I shot a 6mm-284 in 1000-yard benchrest. It was a great rifle and a great cartridge, though a noted 'barrel-burner'. In its fourth year of competition, with over a thousand rounds down the barrel, I began to have a problem. About one in every ten shots didn't hit the target. This completely ruined several shoots before I finally realized that the 'missing' bullets were in fact 'exploding' en-route to the target. Reason? When the barrel was eventually 'scoped' the first twelve inches or so were completely 'fire-cracked'--just like the above photograph. The fire-cracking was so severe that it was tearing-up the bullet jackets--so badly in some cases that they clearly weren't holding together under the centrifugal force generated when spinning at something like 300,000 rpm. Having my own borescope would have revealed this problem and saved me a wasted season. At right is a good bore which isn't getting cleaned properly. You can clearly see the copper and powder-fouling. In this condition, it will never deliver its maximum accuracy. But, without a borescope inspection, how would you know what the problem was? The photograph shows only a tiny portion of the bore--about one tenth of one-percent of the barrel. Imagine the amount of copper--it will take hours to remove it using a good copper-solvent. But remove it you must--to restore accuracy. Better not to let it build-up in the first place of course, but that's easier said than done. Another example. A shooting colleague started to have difficulty chambering rounds in her .308 target rifle. She has shot the same rifle, with exactly the same bullet, dies etc. for five years. She is a fanatical bore-cleaner--the type who never puts a dirty rifle away. She always uses a bore-guide and has all the proper jags, brushes, fluids and patches. 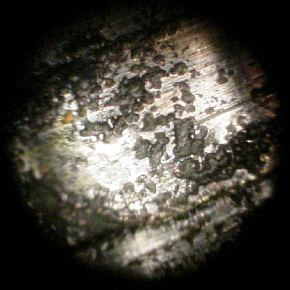 The borescope quickly revealed the problem--a hard ring of copper and carbon immediately in front of the chamber. When you use a bore-guide (and you always should do) it can sometimes 'protect' this bit of the bore from the cleaning-brush. Although the rest of the bore was spotless, this section was not. Once we knew where the problem was, it was simple matter to carefully remove it. The borescope told us exactly when we had done enough. More horror photos below. Could your rifle's bore look like this? If so, you're wasting ammo! Are you sold on borescopes? OK, but exactly what do you get for your hard-earned money? In some respects not much--a couple of stainless-steel tubes, a series of lenses, a mirror and a light-source. The light-source is simply a Maglite® torch--the other bits are not so simple. The borescope is a tube within a tube. The outer tube will easily pass down a .223 bore but the lenses are in the inner tube, so you can imagine how small they are. Does anyone else make a borescope? 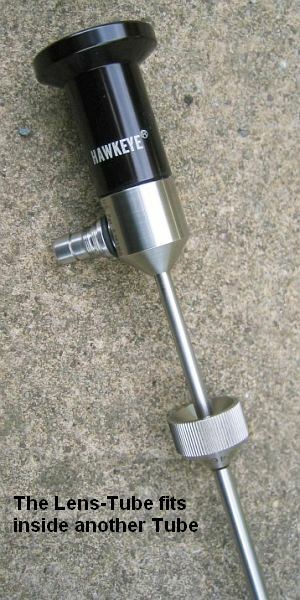 Yes is the simple answer but they are for serious industrial use, and most are way more expensive than the Hawkeye. A borescope is about the same price as a new barrel but by improving your cleaning and bore maintenance regime, it could pay for itself in a few years. If you want one you are going to have to do what I did and buy one. You can purchase directly from Gradient Lens Corp., (800) 536-0790, or from an authorized dealer such as MidwayUSA or Sinclair Int'l. In the United Kingdom, Fox Firearms of Manchester, Tel: 0161 430 8278, usually have a couple in stock. The Limited Edition Hawkeye model, designed for shooters and gunsmiths, runs about $560.00 from Sinclair Int'l, item #HS17. This 17" borescope includes the same light source, mirror adaptor, and cleaning kit as the regular Hawkeye #HS17FE-K, which retails for about $850 (street price). You don't get a focusing eyepiece or hardcase with the $560 Limited Edition, but focus is pre-set for 22 through 30-caliber barrels. The same model with focusing eyepiece (item HS17FE) is $599.00. 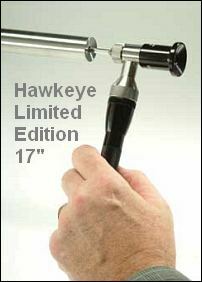 The Limited Edition Hawkeye is shipped in a padded cardboard case and can be disassembled in seconds with included Allen wrench. 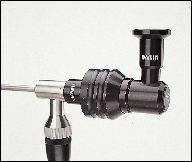 For more information on the Hawkeye Borescope, log on to Gradient Lens' website, GradientLens.com. Copyright © 2005-2006, Vince Bottomley and "Precision Rifle Webzine", All Rights Reserved, used by Permission. Some images from Gradient Lens Corp., used by Permission. Layout and images otherwise copyright © 2006 AccurateShooter.com | 6mmBR.com, All Rights Reserved. No reproduction without advanced permission in writing.